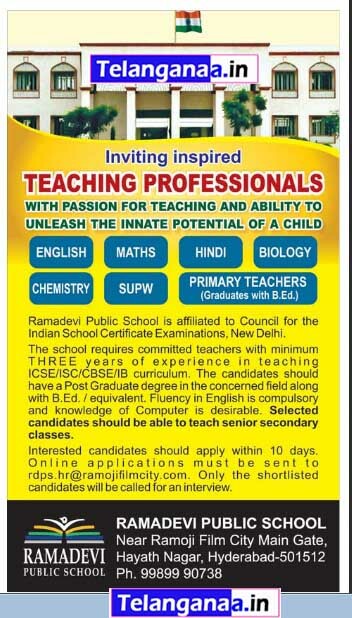 Ramadevi Public School, Hyderabad invites applications for Teaching Professionals. Subject:- English, Maths, Hindi, Biology, Chemistry, SUP & Primary Teachers. Qualification:- PG Degree in the concerned field along with B.Ed./ equivalent. Experience:- Minimum 03 years of experience in teaching ICSE/ ISC/ CBSE/ IB curriculum. How to Apply:- Candidates should apply within 10 days. School Address:- Ramadevi Public School, Near Ramoji Film City Main Gate, Hayath Nagar, Hyderabad.